Kristy McCullough and her friend were looking for cheap accommodations near Tokyo Disneyland, when the Henna na Hotel Maihama Tokyo Bay, a hotel manned predominantly by robots, popped up in her search results. “It was quite cheap and the novelty of it made it worth it,” she says. They ended up booking two nights for about $90 per night around Christmas 2018. Rates can be as low as $60 or $70 per night depending on the season, but a stay in mid-March, which is peak travel time, costs about $140 per night. 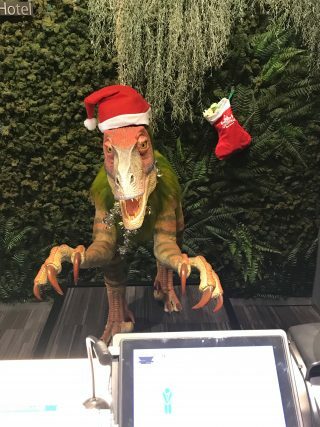 At the check-in counter were two raptors in hats. Check-in was easy for McCullough. “They had English-speaking options for tourists, and a scanner for your passport so no ‘human’ assistance was required,” she says. Each room also has its own personal little robot which talks and can control the temperature, lighting, and it will even play games with you. For those looking to explore the nearby park, the hotel is just a 5- to 10-minute bus ride to Disney. So how can you get to Tokyo on miles to see this unique hotel? Two of Japan’s major airlines, All Nippon Airways (ANA) and Japan Airlines (JAL), both have service from U.S. locations to Narita International Airport, which serves the Tokyo market. ANA, which is headquartered in Japan, has service from Chicago, Houston, Los Angeles, New York, San Francisco, Seattle, San Jose, Washington D.C. and more to Japan starting at 60,000 miles for an economy roundtrip. You can not book a one-way flight on the carrier. To get the lowest rate, fly during low season which is Jan. 7 – Feb. 28 and April 1 – 25. If you don’t have ANA miles, you can transfer American Express Membership Rewards to the airline’s Mileage Club program, but be sure to check for availability first. ANA is also part of the Star Alliance, so you can also use United MileagePlus miles to fly on ANA or United, which has flights for 35,000 each way. Japan Airlines has service from Boston, Chicago, Dallas/Fort Worth, Los Angeles, New York, San Diego, San Francisco, Seattle and Vancouver and is the cheapest at only 50,000 miles roundtrip. Japan Airlines is part of the Oneworld alliance so you can use American Airlines AAdvantage miles to fly there. It will cost about 65,000 AAdvantage miles at the MileSAAver rate to fly on AA metal. Some cities may require a connecting flight so be sure to look at flight times to avoid long layovers. Tickets to Japan can be expensive at close to $900, so using miles makes sense. But it’s a popular destination, so try to book in advance to find award space. And since it’s a long flight from the U.S. (it takes 14 hours from NYC), you might want to think about booking a premium seat if you have the miles to splurge. Featured image courtesy of Henn na Hotel. Christmas-themed photo courtesy of Kristy McCullough.